I have loved architecture since before I really even understood what architecture was. I built countless houses and structures out of Lego-like interlocking blocks as a kid (it was only recently that I got the real thing). I sketched plans for very elaborate houses on my father’s accounting ledger paper. And eventually I applied to and got into the architecture program in college. And long story very short I got a degree in psychology. But the love of architecture never faded. I focus on architectural photography quite a bit in my photography and have had the opportunity to actually be paid for some of my work lately. As a result I have picked up a few tips on improving your architectural photography. Here are five quick and simple ones that can have a great impact on the final image. 1. Lighting – This one applies to more than just architectural photography. But lighting can make or break an architectural photograph. So pay attention to how the light is interacting with the building you are photographing. Watch for shadows too. Some lighting mistakes can’t be fixed in post processing no matter what you do so it is better to be aware while you are shooting. As a general rule, the best times of day to photograph are often right around sunrise and sunset. The “golden hour” light can show a building in a whole new light, so to speak. Sometimes waiting just a few minutes can have a big impact on the image. The photo on the left was taken at 6:39 PM and the one on the right at 6:53 PM. Not only is the sky very different but the artificial lighting on the building itself takes on a whole new effect just 14 minutes later. 2. Move – The first position you pick to shoot may not be the best. Move around the building and check it out from all perspectives. Where possible get up high and get down low to see how the architecture looks from various vantage points. Step across the street and even go around back, you never know what the building might offer from a lesser viewed perspective. If there is an obstruction often times it can be eliminated from the shot if you move over a few feet. 3. Rearrange – Keep an eye out for things that could be a distraction in your shot. 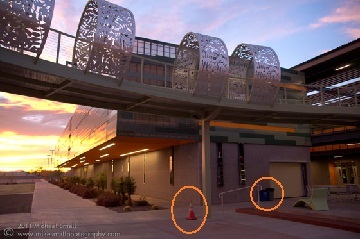 Garbage cans, traffic cones, trash, even people can either just look bad in a nice clean architectural photograph or be a real distraction depending on their placement. But if you scout out your scene first you can easily spot the distractions and move them out of your shot. Just be sure to put them back once you are done. 4. Be Aware – Sometime you so focused on the architecture itself that you are blind to the surroundings. Just like the small distractions mentioned in number 3 above things like light posts, signs, vehicles and even other buildings can ruin an architectural photograph, especially if you did not intend for it to be there. These things are much more difficult to just pick up and move. So this is where you have to incorporate tip number two and move yourself or reframe your shot to eliminate these elements. Worse case scenario you may have to figure out a way to make something you did not intend to be there just work. Work it into the composition of your photograph. 5. Shoot – Depending on who you ask, some photographers will say to not push the shutter until you have composed the perfect shot and then just shoot once. Others will say to shoot as many shots as it takes. Given the flexibility of the digital format I follow the later school of thought. 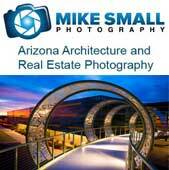 Especially in a field like architectural photography for a subject that can have infinite angles and perspectives. I believe you should strive to perfect your shot as much as possible in the field (sometimes there is no going back) but when even a few minutes can produce an entirely different lighting effect or a few step in one direction and present a whole different perspective I say shoot as many images of your subject as you can. You can easily sort through and delete the bad ones in post processing. Enjoyed reading the info. I sometimes feel that here is only a “golden minute” to catch that perfect shot.